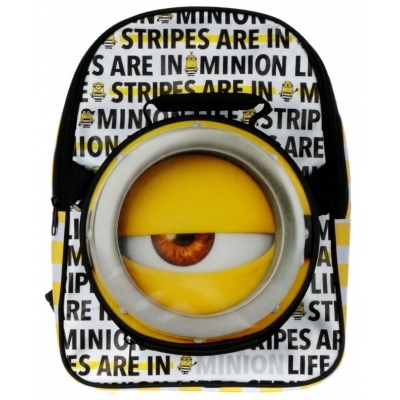 This super cool Despicable Me Stripes are IN detachable Backpack is ideal for any Despicable Me fan. 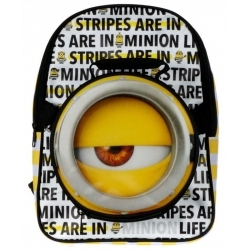 The backpack features images of minions and repeat phrase saying "STRIPES ARE IN. MINION LIFE" at the front; white and yellow stripes on the side and black back. The backpack also has a detachable part with an image of a large minion eye on it, it attaches to the backpack with velcro straps. The detachable part has a handle and can be used as a lunch box or to store pens/pencils and other small items. The backpack offers plenty of storage space and is the ideal school bag for your little-one to take to school or on day trips out; and the adjustable shoulder straps will be sure to offer ultimate comfort and fit.